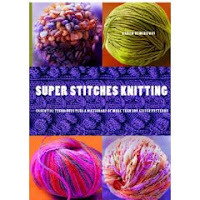 Super Stitches Knitting by Karen Hemingway contains over 300 stitch patterns, including basic knit and purl stitches to ornamental, stitches, textured colorwork, edgings, lace, and the list goes on. The reason I needed to buy this book is the beautiful pictures of each stitch pattern. And the directions for each pattern are clear and well explained: there are written and chart instructions (where you would expect charts). I can't wait to have a couple of hours to go through this book and dream up some new designs!